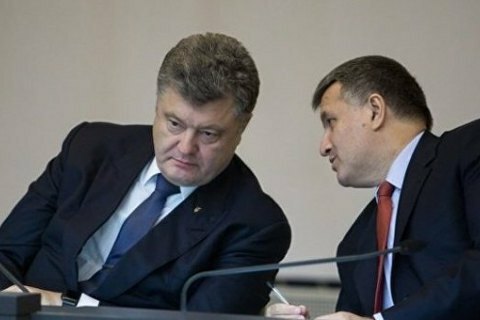 Petro Poroshenko seeks to concentrate entire control over uniformed agencies, says Avakov's aide. President Petro Poroshenko and Interior Minister Arsen Avakov have been in conflict since the presidential election, says MP Anton Herashchenko, who is close to the head of interior ministry. Speaking on the ICTV's Freedom of Speech talk show Herashchenko admitted President Petro Poroshenko and the interior minister Arsen Avakov have opposing viewpoints on the matters of law enforcement and national security ever since the presidential election." "The president wanted to concentrate all authority over law enforcement agencies in his hands. Meanwhile People's Front party, myself included, and Arsen Avakov believe that this is a very dangerous practice. We have seen the former President Viktor Yanukovych, who had full control over the security forces in the country, and you remember what how it ended," he added. At the same time, the leader of the faction Petro Poroshenko Bloc, Artur Herasimov, denied any serious conflict between the president and the minister. Avakov has headed by the interior ministry since February 2014. He was one of the leaders of the People's Front, one of only two political forces in the ruling coalition. Is Italy on the verge of a "Russiagate"? Will a journalistic investigation change Italian voters' preferences? The German leader's visit is of symbolic importance to the upcoming presidential election.